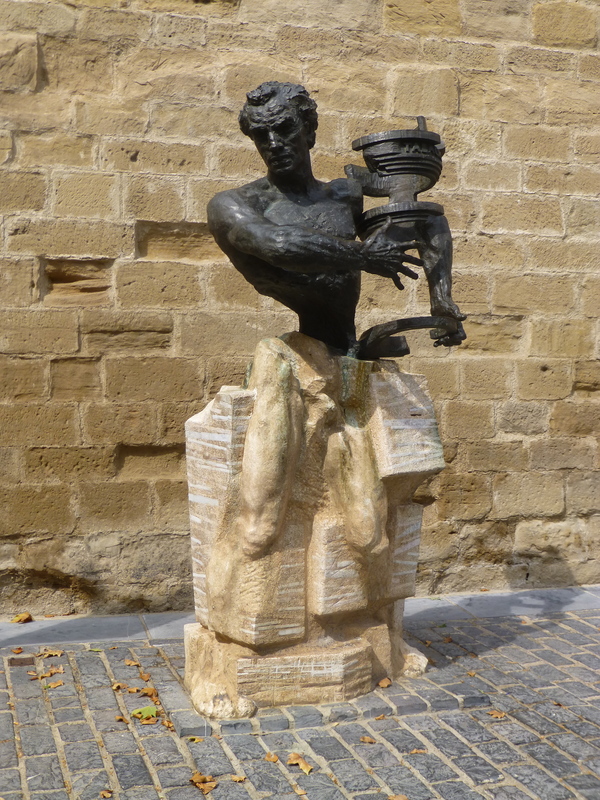 The fabled Fuente del Vino: A wine fountain? Really? Drinking fountains were well spaced along the way but the one fuente everyone talked about was on the outskirts of Estella at the Benedictine Monasterio de Irache. 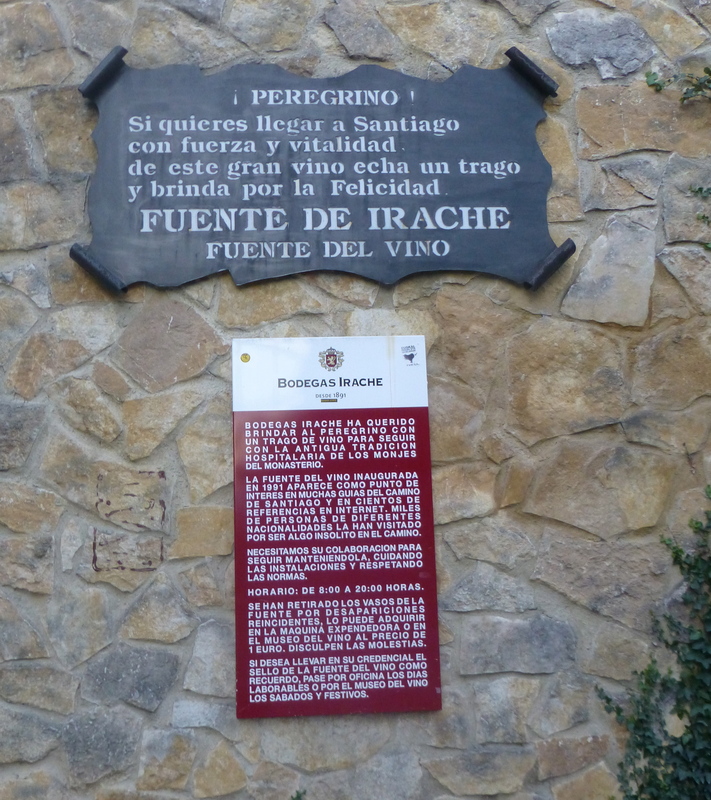 A sign on the outside of the building promises that a glug of wine from the “fountain” will help pilgrims on their way to Santiago and bring them luck. It was still early when we reached it, only 6.36am according to my camera record, but it was a right of passage so, one by one, we queued to stick our heads below the tap, turn it on and sink at least a couple of mouthfuls. We bought bread, cheese and ham for lunch then I stormed on alone for the next two hours across acre after acre of harvested wheat fields to find spaces for Irish John, Yvon, Donald and myself at the Casa Mari albergue in Torres del Rio. Communication with the fag-puffing hospitalera proved troublesome and highly amusing when she just upped the volume in her bid to make me understand. It turned out she wasn’t keen for me to hold on to so many places as more and more pilgrims turned up looking for beds. She was also unsure about me sharing a room with three men! To be honest I wasn’t so sure myself when John threw down his pack and warned us about his snoring. The oversubscribed showers and loos were outside and noisy Germans prevented a late afternoon nap but the day ended with a fabulous dinner with old friends – Ramon and Suzanne, Doug and Pam, Massimo the Irish priest had all turned up – in an old stone inn. 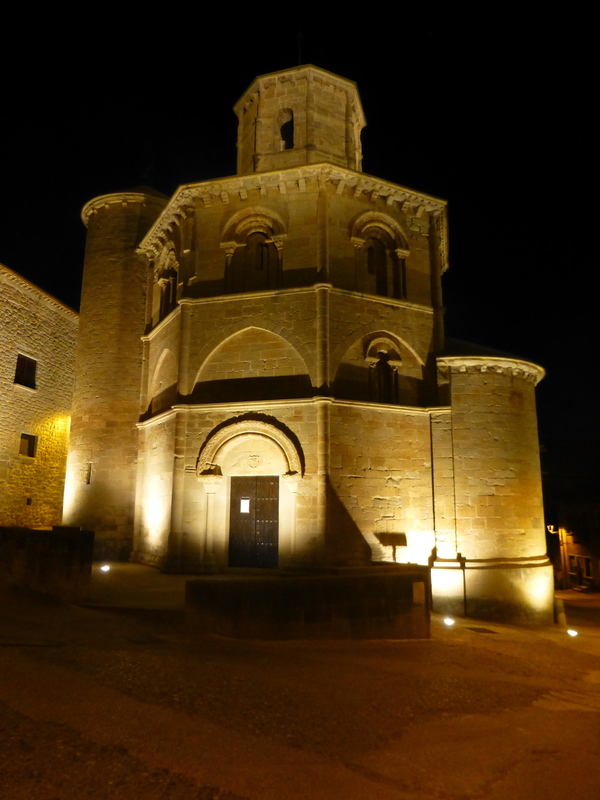 We took a detour back to the albergue in the late evening heat and took time to admire the beautifully lit Iglesia de Santo Sepulchro.